When Jack emerges from his tent, he discovers that he is all alone. During the night, his mother has disappeared, abandoning him in Acadia National Park. At first, he figures that she has just gone off on an errand, but when she doesn't return and days start to pass, he realizes that he is going to have to survive on his own. And, while he is only eleven years old, he turns out to have plenty of experience at getting by. So, he strikes out across Maine, trying to find his mother and avoid being picked up. Ah! The ol' abandoned child motif! One of my least favorite genres (second only to the child-avoiding-being-helped subgenre)! By all rights, I should despise this book. 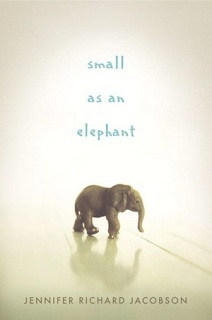 But the story benefits from two things: a nice elephant theme throughout (facts about pachyderms preface each chapter and are coupled with Jack's obsession with the animals) and the amazing (but believable) resourcefulness of the kid himself. Still, this is a genre that can only end up one of two ways (and it isn't very hard to figure out which way it will go). In the end, a breezy read but unremarkable.